Bang & Olufsen just unveiled its newest wireless speaker system called the BeoPlay A6 designed by famed Danish designer Jakob Wagner. Billed as a high-end wireless AirPlay and Bluetooth-capable speaker system for home or office enjoyment and covered in beautifully textured Kvadrat textile, the BeoPlay A6's uniquely designed contoured body and five perfectly angled speaker drivers means that it can delivers spacious and detailed sound no matter where it's placed or where you stand. It can be hung on a wall, put in a corner or simply placed anywhere you'd like thanks to some clever thinking by Bang & Olufsen and the A6's unique shape along with predefined audio positioning modes that can effectively spread sound all around the room. 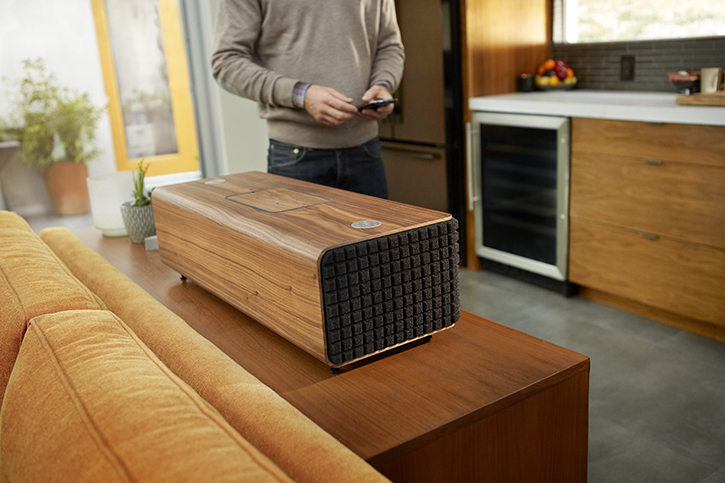 In an unexpected surprise, JBL has unveiled two high profile wireless speakers at CES 2014, which are part of the company's new Authentics series. The JBL Authentics L16 (above) and JBL Authentics L8 wireless speaker systems both feature wireless Qi charging surfaces that will keep your smartphone charged as well as AirPlay, DLNA and Bluetooth connectivity, enabling audio to be streamed from any wireless device, as well as a seamless precision cut foam grill inspired by the legendary JBL Century L100 loudspeaker. They feature authentic materials, system optimized low-frequency and high-frequency JBL transducers, and the meticulous acoustic design that is expected from JBL. With JBL Authentics speakers' 24-bit / 96 kHz digital signal path, you'll hear studio-quality sound. Audio CDs reproduce sound at a 44.1 kHz sample rate, at 16 bits per sample. But recording studios work at a 96 kHz sample rate, with 24 bits per sample. The JBL Authentics L16 and L8 wireless speaker systems support this higher, studio-quality sample rate and bit depth, all the way through. The result is jaw-dropping audio quality and a wide stereo image from a single enclosure, ideal for any audiophile. The JBL Authentics L16 Sound System features a walnut-veneered enclosure and supercharged three-way sound, with six 50W amplifiers driving six speakers to fill any room with exceptional volume and unbeatable audio at studio-quality 96 kHz/24 bit. The JBL Authentics L16 also boasts all-around connectivity via AirPlay, DNLA and Bluetooth, as well as analog, optical, and on board moving coil and moving magnet phono preamps. The free JBL Music™ app gives control over the speaker through both iOS and Android mobile devices. JBL's L16 can be pre-ordered today for $1,000, and is expected to ship next month. The JBL Authentics L8 Sound System is housed in a wooden enclosure with a gloss black piano-quality finish. JBL Authentics L8 Sound System supports studio-quality audio, at 96 kHz/24 bit. Its exceptional audio quality comes with the latest wireless technology for connectivity with a wide range of devices via AirPlay, DNLA and Bluetooth as well as optical. 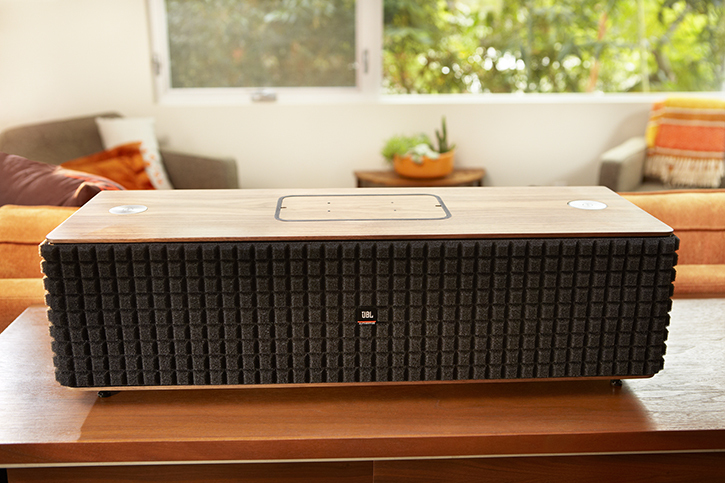 The free JBL Music™ app turns any iOS or Android mobile device into a remote control. Enjoy studio-quality stereo JBL sound and wireless versatility from a single, stylish enclosure. JBL's L8 can be pre-ordered today for $600, and is expected to ship next month. Harman Kardon's beautifully designed new Aura wireless AirPlay speaker is a self-contained home audio system combining the ultra-modern performance and precision of a hi-fi luxury sound system, whilst also boasting a unique, iconic transparent dome design inspired greatly by Harman Kardon's SoundSticks subwoofer. The Aura has a sound as rich and rewarding as its appearance with six 1.5" high and mid-range transducers plus a built-in 4.5" subwoofer delivering superior, Omni-directional, 360 degree sound. While elite features like built-in wireless Bluetooth, Apple AirPlay lossless audio streaming and DLNA introduce you to the convenience and multi-function advantages of complete connectivity. Harman Kardon's Aura is available now for $400. Satechi recently introduced the Dual Sonic Speakers, an inexpensive USB-powered 3 watt compact desktop speaker setup for people on a tight budget and limited space. With a sleek blue LED accent lightning and a brushed metal finish, the Dual Sonic Speakers feature an Acoustic Air Spring technology claiming to produce crystal clear sound with increased dynamic bass, mids and highs. Satechi's Dual Sonic Speakers are available now in silver or black for $25. Nocs has finally released its first set of high-powered monitor speakers called the NS2 Air Monitors. It's been a long time coming, and we think these are the sleekest looking pair of monitors we've seen in a long time. The minimalist Swedish designed NS2 Air Monitors are one of the first monitor speakers to feature AirPlay Direct functionality, which lets you wirelessly stream high quality music and audio on a WiFi network from your Mac, PC and iOS device. The cool bit is that the NS2 Air Monitors will even create their own little WiFi network in case you don't have an internet connection thanks to the AirPlay Direct technology. So you could always enjoy the fruits of wireless AirPlay streaming no matter how bad your ISP is. Each monitor houses a 3-inch kevlar coned woofer with dual magnets, and a 3/4" silk dome tweeter tucked inside a beautifully hand-built rubber coated cabinet. Nocs' NS2 Air Monitors will set you back $449, but for that sum of money you'll be enjoying accurate and well balanced sound you can bet will blow your pants off. Not to mention the option of picking between six vibrant colors ranging from orange, yellow, red, black, white and gray. These are available now and can be ordered directly off of Nocs' website in the USA and in Europe.